The Herbert was built in Noank, CT in 1910. The wooden steam lighter was 128 feet long, had a 30 foot beam and displaced 349 tons. 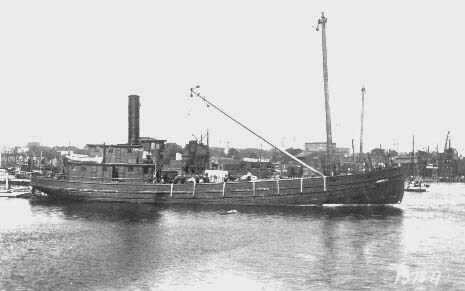 The Herbert was initially constructed as a barge, and later converted to a steam lighter when and engine and propulsion was added. On August 6, 1924 the Herbert was on a voyage en-route from Boston to Ipswich, MA to pick up a cargo of sand. There was very dense fog that morning. In fact, the fog was so intense, that Captain Brooks ordered the steamer to stop and wait for the fog to lift. While the Herbert was drifting, the steamer City of Gloucester collided with the Herbert. The Herbert sank quickly, in less than 20 minutes. All of her crew were rescued. Today, the wreck sits in 100 fsw. The wooden hull is flattened. There is a large bow winch and debris in the bow area. The stern has two large boilers and steam engines still standing. The steering quadrant can be found in the sand a short distance away. Visibility tends to be 10-12 feet. Although the bottom is a harder sand/gravel, it can be murky and dark at times. However, this is an interesting wreck and straightforward to navigate even in low visibility.